It’s a great pleasure to have this interview with Callum, a founder of half dozen businesses and author of Progressive Partnership – the future of business. The interview reminds me why I am here and what I passionate about – digital marketing. I was trained as a system analyst with a programming background so I started off being a bit geeky. After my son was born, I decided that being a full-time mum for my child is more important than my career. In the mid-90s, the internet had just barely started to be available to the public, so without a thought, I built my first website in between looking after my son. People soon realised that there were business opportunities on the internet and affiliate programs were everywhere. As I enjoy travel, I built websites about travelling in Hong Kong and other countries with affiliate links to promote travel-related products. They were a huge success, and they brought me a very handsome income while I could stay home with my children. Now that my kids have grown and go to school full time, I can spend more time on my business. From time to time there are friends who ask questions about promoting their business using website or internet marketing. 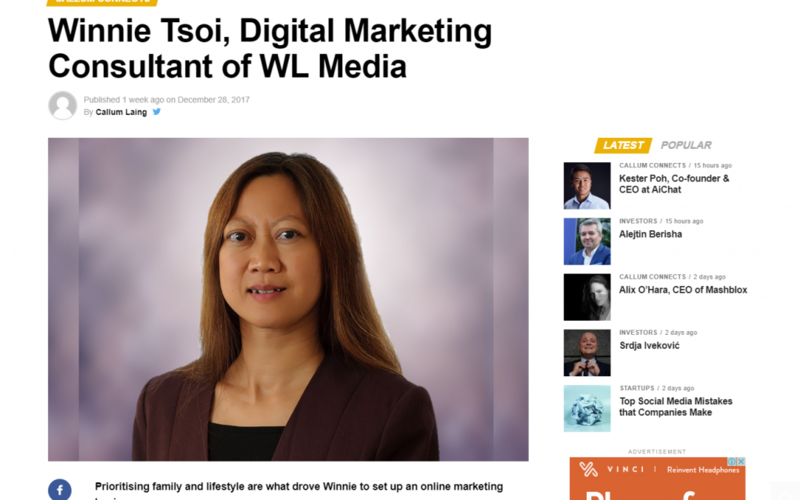 So I decided to expand WL Media to help both SMEs and people like me, who want to earn a living while still enjoying the freedom of doing the things they prioritise most. I love the challenge of internet marketing. There is always something new. It’s changing, it’s evolving, and you need to be creative to win in this game. What works today may be abused and become a taboo. As a former programmer, I like the technical side of it. But I also thoroughly enjoy the marketing part which requires a lot more planning and thinking. Believe in yourself and your dream. Don’t let fear stand in your way. Take full responsibility for the consequences. “Don’t Make Me Think” by Steve Krug. It is a book about web design. Nowadays, everyone should have a website and it should be easy to use or you will lose your potential customers quick. The same principle applies when dealing with your customers offline. Don’t make them think. You should do the hard work and make it as easy as possible for the customers to choose. I like to watch insects and different life forms in my garden. I have photoed and recorded the life cycle of stinky bugs’ eggs. Puzzles are my favourite too. Once I start a puzzle, I cannot put it down until I have finished it.